Not really sure what you want or need? Have a certain problem that your not sure of the best solution to? We offer a full 'In Home' Consultation Service bringing our professional expertise, samples and ideas to your home to help you in whatever situation you are in. We can bring out a range of samples and help with colour and design choices as well as help with more technical issues as well. Don't hesitate to contact us and get us out to your home today. This service is completely free of charge with no obligation. Call us today 09 2389326. Or for a few quick ideas, we answer a few frequently asked questions or provide solutions to common problems people face below. Have a look through and if these still don't answer your questions, or you're still not sure, give us a call today and we will be able to help you find the best solution to your problem. NEED TO BLOCKOUT THE LIGHT? Are you a shift worker? Trying to get kids to sleep while the sun is still shining bright? Or maybe you just like to sleep in on the weekends. If a dark room is what you require there are a few different ways to tackle this. A combination of drapes and romans with a good blockout lining is probably your best solution. Roman Blinds - Romans with a blockout backing are a great way to give a nice tight closure of the window and are perfect for the high windows above the bed. They fit nice and snug and cover over the edges of the frames really well, eliminating too much light seeping in. Make sure you get a good blockout lining. Drapes - Ideal if you have large full length windows in the bedroom, used in combination with Romans or just all drapes. If you are using drapes on a window, make sure you take them a good distance above and below the window as well as a good amount either side, to help eliminate that cheeky sunlight trying to get through. In this situation a pleated curtain would work much better than an eyelet curtain as the eyelet will let more light in above. Thermacall/Duette/Honeycomb Blinds - If you really would prefer some sort of blind then a blockout version of these are your best option - they fit nice and tight inside your window frame so there is less chance for the light to creep in around the edges. 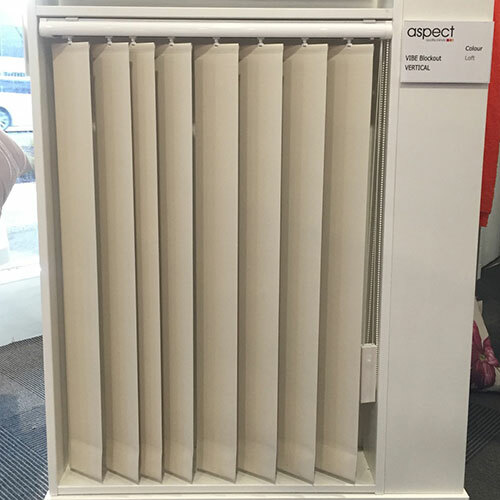 They are a much pricier blind but they also give excellent thermal properties. Shutters - Shutters can also provide great light block - their blades shut much tighter then that of a venetian and there are no holes for cords etc to let more light in. You can also get 'lightblock' panels that will fit around the outside edge of the shutter to close off any small gaps that can let the light through also. Roller, Vertical and Venetian Blinds are not really recommended as the best window treatments to help block out the light. A roller blind which is usually fitted on the inside of the window will always have gaps, top and bottom and each side where the light can get in. The same with a venetian or vertical, plus the light can seep in through the gaps between each slat or vein. In winter time our windows can let a huge amount of heat out, leaving the rooms cooler than we would like. The best way to keep heat inside is to have a good thermal covering over your windows. There are several treatments that are excellent at providing extra warmth and insulation as listed below. Thermacell/Duette/Honeycomb Blinds - These blinds are awesome at giving you extra insulation, their main purpose is to help keep the warm air inside your room from escaping out the windows. If your main purpose is warmth in a bedroom these are a great choice - a bit more expensive than other treatments but they do an amazing job. Drapes - Drapes with a good quality blockout lining on them will also give you great insulation properties. A blockout lining will give you a lot more warmth and insulation than a standard thermal lining as it is much thicker and has more layers - so if you are tossing up between the two for warmth reasons - always choose blockout. 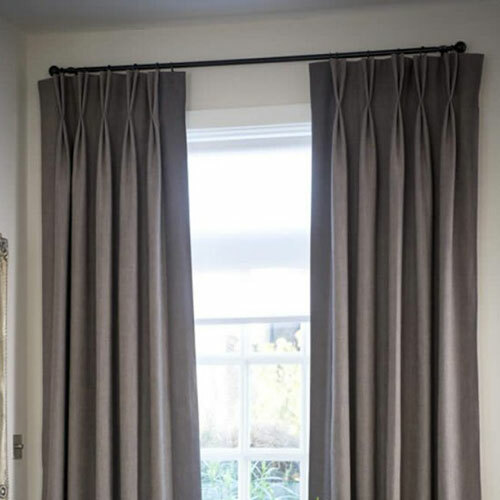 The best way to get the most insulation you can from your drapes is to make sure they cover your windows well, any gaps the heat can sneak out of it will, so best to take them well over the sides and well over and under the frame too. The best possible way to do it is to have them going down and touching the floor and having a pelmet on the top, eliminating any gaps at the top and the bottom. Pelmets are extremely good at helping to trap that heat in. 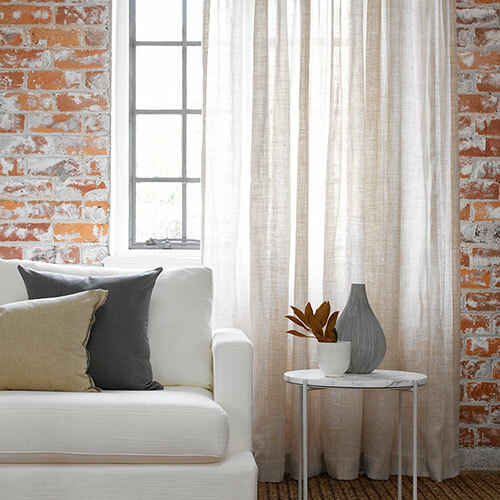 Roman Blinds - Romans with a blockout backing are also a great way to keep warmth within your room. They fit nice and snug and cover over the edges of the frames really well, eliminating too much warm air sneaking out and cold air sneaking in. Make sure you get a good blockout lining. NEED PROTECTION FROM THE SUN? Is the sun pouring in your windows damaging your furniture or making it glary inside? Need something to keep the suns harsh rays out during the day? 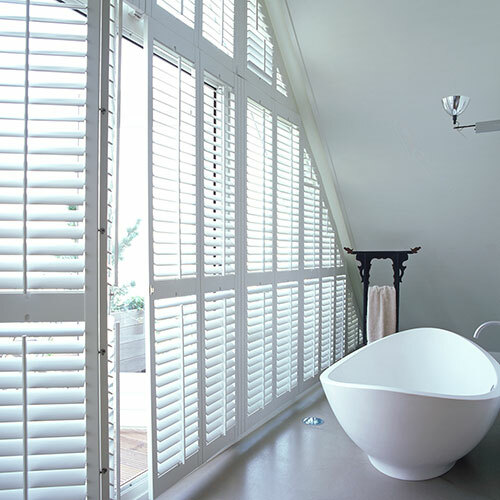 There are a few options you can use here, from blinds to sheers we have an answer for you. Sunscreen Blinds - Probably the most common and popular option for this problem. 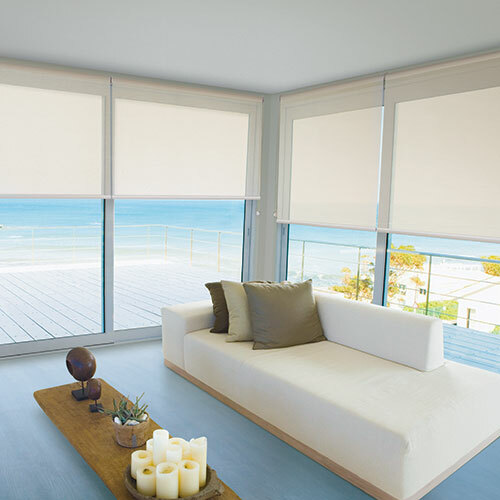 Sunscreen Roller Blinds help to cut out the suns harsh rays while still allowing light to penetrate through as well as enabling you to still see outside. You can get a huge range of different colours and styles so there will be something to suit your decor. An interesting fact to think about when choosing the colour of your sunscreen blinds is that the darker the colour the easier it is to see out of. We also have several different sizes of weave in the standard sunscreen, so if you want a lot of protection then you would choose the smaller or tighter weave, whereas if you want protection but still want as much light as possible to come in and to be able to see out well then perhaps the more open weave would be more suited to you. 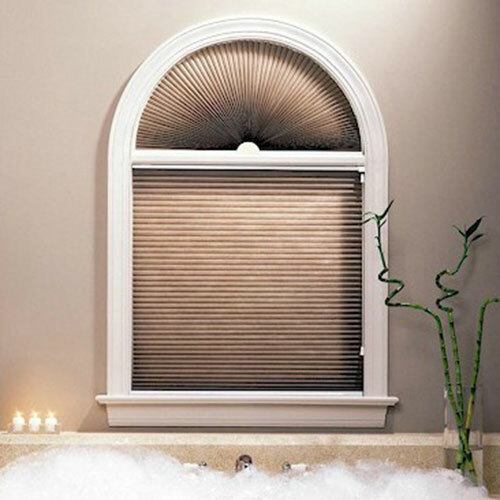 Venetian Blinds - Venetian Blinds are great as you are able to angle the blades to direct the light as you wish and then close them off completely as well if you like. They don't work as well on larger windows and doors so in this case we would recommend going to a sunscreen, especially on doors as when the venetian's are pulled up they will still take up a bit of room at the top of the window frame - much more than a roller blind. They also cause more interruption to your view outside than a sunscreen blind does. 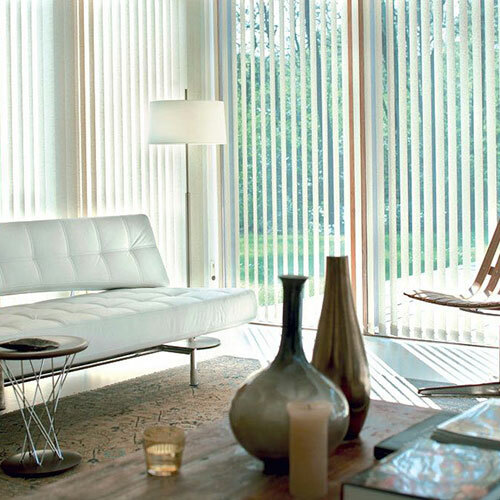 Vertical Blinds - Vertical Blinds are also great in the fact that you are able to angle the veins to direct the light as you wish and then close them off completely as well if you like. These also work well on large windows and doors as they can be pulled fully open to the side if need be out of the way of the door. They too cause more interruption to your view outside than a sunscreen blind does. 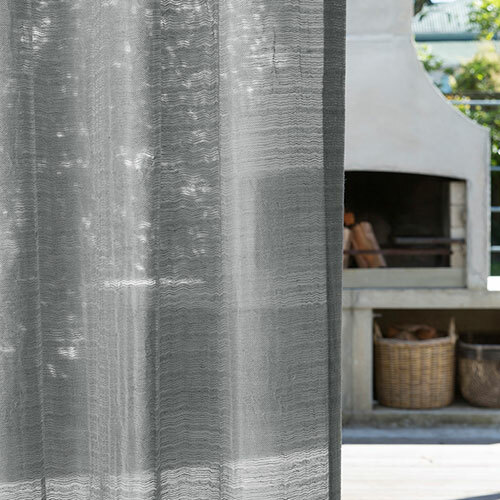 Voiles or Sheers - Voiles or sheers are also a great way to help protect your furniture etc from the sunshine. There are several ways of doing this too. You could have the sheers on a wire or track inside the window frame like you do the more traditional nets. Or you can have a double track system on your wall, outside the window with your sheers on the back to be across during the day and your drapes on the front to pull at nighttime. Or the more modern way of doing it is to have the double track system but to have a really nice sheer, and have it on the front that you can have across during the day and then you just have a lining on the back to pull at night time. There is a HUGE selection of different voiles and sheers so no doubt you will find something to suit. 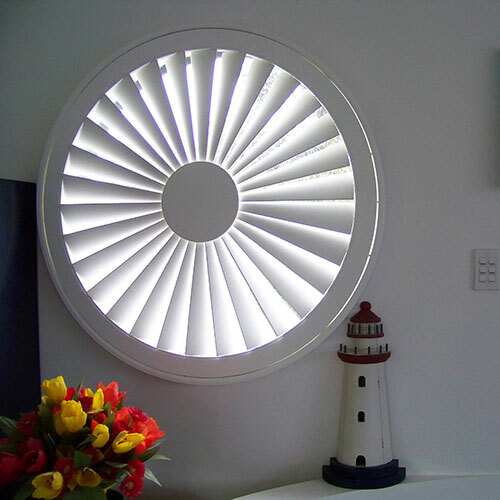 Shutters - Shutters are also great as you are able to angle the blades to direct the light as you wish and then close them off completely as well if you like. They work fine on larger windows and doors too as they can either be made to bi-fold open or be on sliders that will slide open and shut. They also cause more interruption to your view outside though. 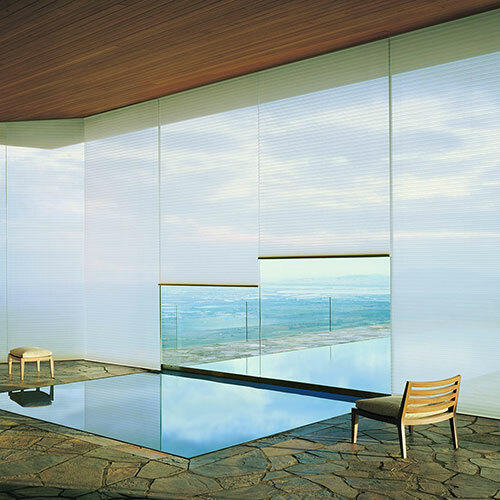 Do you need some privacy in your home? 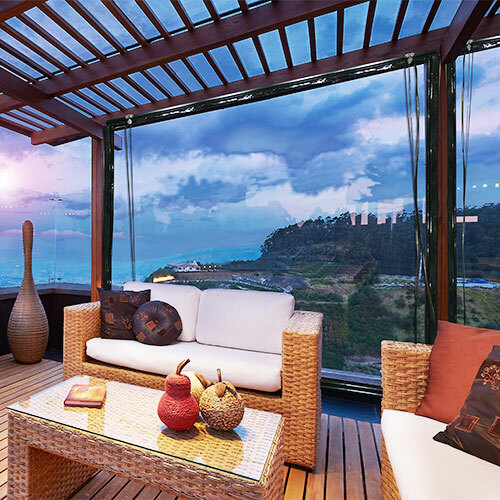 Do you have large open windows the neighborhood can see in? A sheer or blind is the best way to get some privacy during the day and make you not feel like you are living in a fish bowl. Sunscreen Blinds - Probably the most common and popular option for this problem. 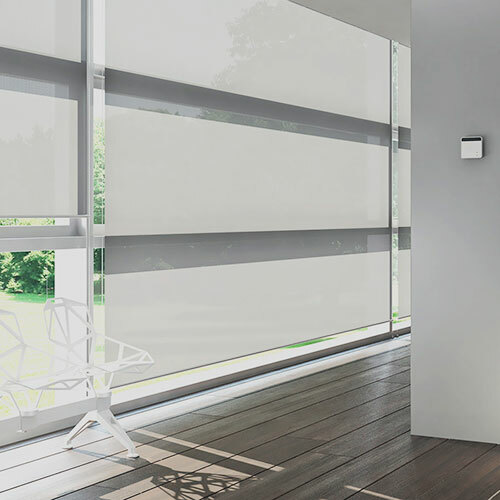 Sunscreen Roller Blinds give you privacy inside, stopping people being able to see through them from the outside but still enabling you to see outside. You can get a huge range of different colours and styles so there will be something to suit your decor. An interesting fact to think about when choosing the colour of your sunscreen blinds is that the darker the colour the easier it is to see out of. We also have several different sizes of weave in the standard sunscreen, so if you want a lot of protection then you would choose the smaller or tighter weave, whereas if you want protection but still want as much light as possible to come in and to be able to see out well then perhaps the more open weave would be more suited to you. 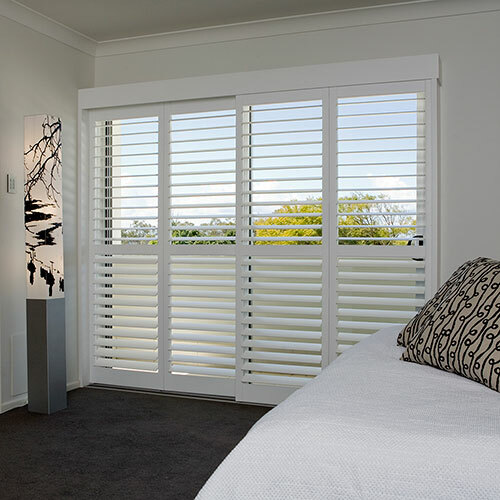 Venetian Blinds - Venetian Blinds are great as you are able to angle the blades to alter the view in and out of your window. You can have them angled so that you can still see out and you get some light in but people outside will struggle to see in at you and then you can close them off completely as well if you like. 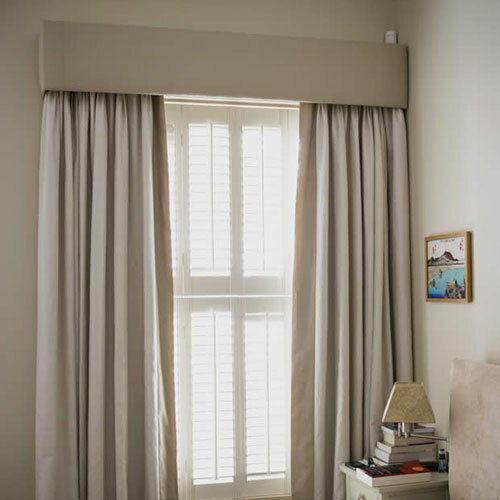 They don't work as well on larger windows and doors so in this case we would recommend going to a sunscreen, especially on doors as when the venetian's are pulled up they will still take up a bit of room at the top of the window frame - much more than a roller blind. They also cause more interruption to your view outside than a sunscreen blind does. Vertical Blinds - Vertical Blinds are also great in the fact that you are able to angle the veins to alter the amount of privacy as you wish and then close them off completely as well if you like. These also work well on large windows and doors as they can be pulled fully open to the side if need be out of the way of the door. They too cause more interruption to your view outside than a sunscreen blind does. 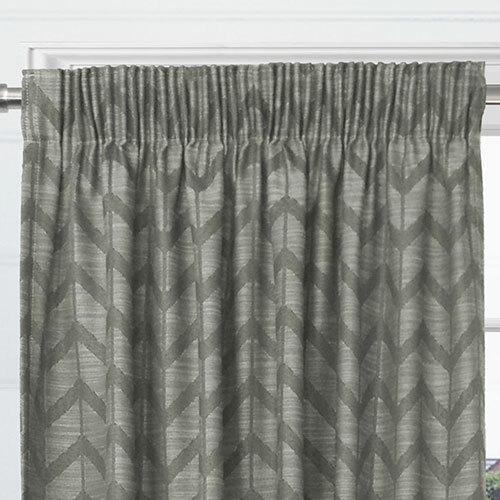 Voiles or Sheers - Voiles or sheers are also a great way to help keep nosy eyes out of your home. The sheer fabrics let light through whilst giving you privacy inside. There are several ways of doing this too. You could have the sheers on a wire or track inside the window frame like you do the more traditional nets. Or you can have a double track system on your wall, outside the window with your sheers on the back to be across during the day and your drapes on the front to pull at nighttime. Or the more modern way of doing it is to have the double track system but to have a really nice sheer, and have it on the front that you can have across during the day and then you just have a lining on the back to pull at night time. There is a HUGE selection of different voiles and sheers so no doubt you will find something to suit. 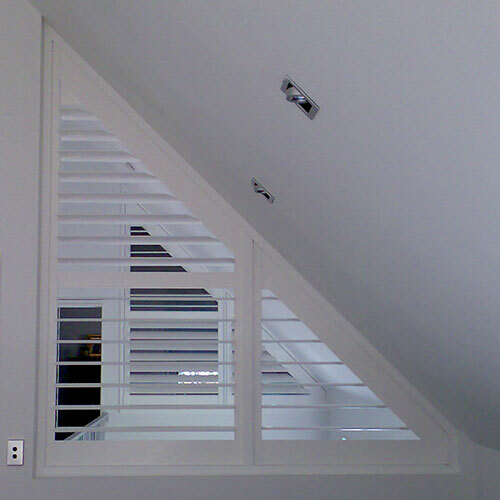 Shutters - Shutters are also great as you are able to angle the blades to alter the privacy as you wish and then close them off completely as well if you like. They work fine on larger windows and doors too as they can either be made to bi-fold open or be on sliders that will slide open and shut. They also cause more interruption to your view outside though. NEED THE MOST ECONOMICAL CHOICE? Rental? Spec Home? Temporary fix? Or just needing to cover your windows without spending a fortune? There are several ways of doing this that wont break the bank! 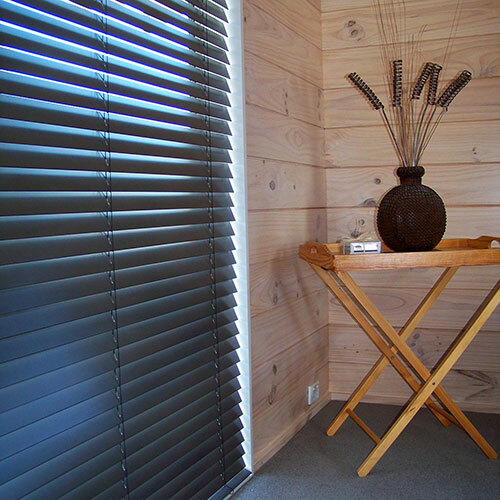 Vertical or Venetian Blinds - These blinds are great as an economical choice if you are after both daytime privacy and sun protection as well as something solid to shut at night. They wont give you a huge amount of insulation and light block but they will definitely give you night time privacy, whilst keeping some heat in and blocking out a good amount of light. Verticals being the cheaper of the two are also probably the best option to be used throughout the whole house. They work great on both large ranchsliders and well as small bedroom windows. Readymades Readymade Curtains are probably one of the most economical ways to cover your windows. Nice and cheap as long as you can make the sizes work for you - the price starts increasing if you have to get them altered to fit. There are some really nice options available these days too that don't look like 'cheap readymades'. Pop instore and check out a huge range. We also have really well priced prepackaged tracks to hang them on, so you can come in and get everything you need to take them home and hang them up. 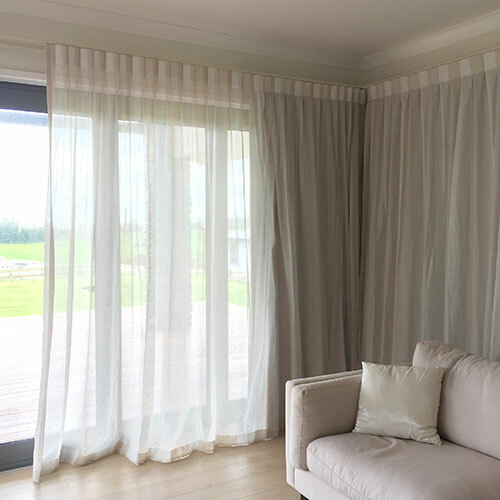 If you also require daytime privacy too however, have a look at our range of net curtains, the most economical way to cover your windows for privacy and to keep the sun out. 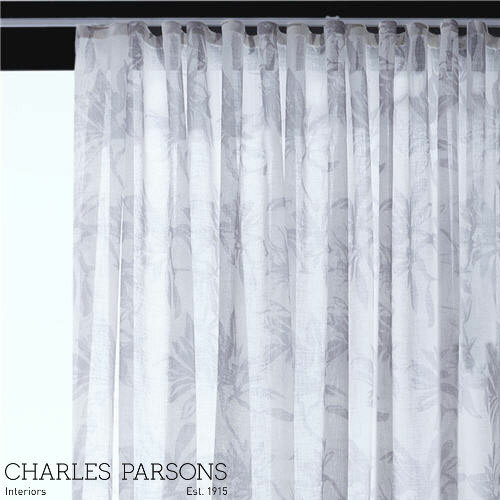 Economical Fabrics for Drapes - If you still need custom made drapes but want to do this the most economical way possible then look out for our range of 'Economical Choices' and also those that we offer a FREE MAKE on. There is an assorted range of fabrics that are all well priced that we can show you. Especially some of the wider width ones that are giving you twice the amount of fabric as standard width fabrics. 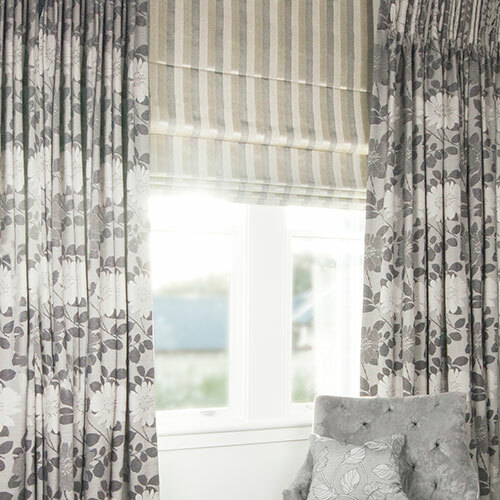 Also if you are wanting both daytime and nighttime options but prefer drapes over blinds; we have several sheer fabrics that are extremely well priced and if you hang these on a double track with our standard stock lining on you can keep the price down quite low. We also have a large range of clearance items from clearance readymades and curtains to clearance tracks and blinds - all oddment pieces so just a matter of finding something that suits. Give us a call today and ask us what the best options are for your home for the best price. NEED TO COVER AN ANGLED OR ODD SHAPED WINDOW? 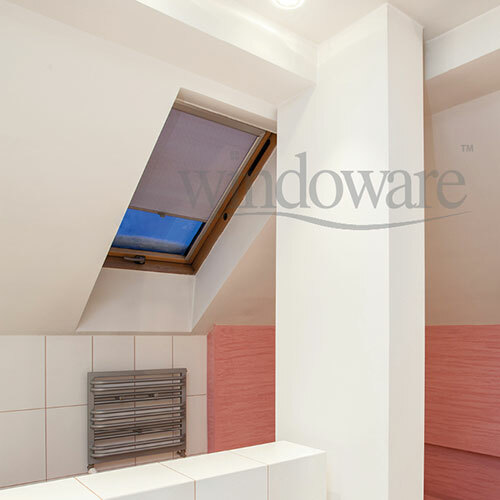 Have you got an angled or weird shaped window your not sure how to cover? There are a few options available, unfortunately the more angles and the more odd it is the harder it is to cover. But never fear there are solutions! If you have a window that has an angled bottom but the rest of the sides and the top are all straight then you are in luck as this is the easiest angled window to cover. You can choose to have a vertical blind for it, drapes with either a straight bottom that extends over the frame or an angled bottom as well. 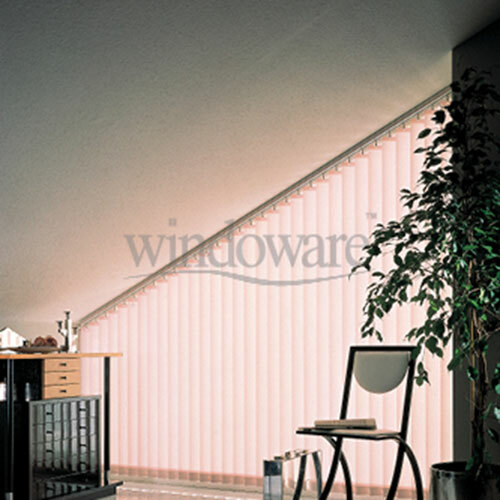 You could also have an angled shutter made or angled Venetian or duette blind. If you have an angled top on the window this limits it a bit more again - you can only really have a shutter, a drape - however sometimes these don't sit right, a Duette or Thermacell Blind and thats really it. The next issue we then face is a curved or arched window? 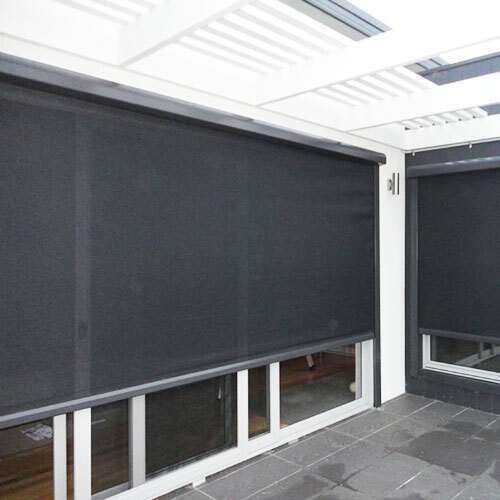 These are really hard to cover and your only real option is a shutter or depending on the shape you may be also able to use a Duette or Thermacell Blind. Maybe its a skylight window you need to cover? No problem, our Shutters or Duette / Thermacells and Honeycomb blinds will do the trick. They are able to cover any slanted or rooftop window and if it is up quite high you can get the blinds motorized for easy access. Shutters and Duette / Thermacell / Honeycomb Blinds are your best bet with odd shaped windows. They are extremely versatile and can be made to fit most shapes and sizes. Contact us today and one of our friendly consultants can pop around and have a look at your window to help you decide which option will work for you. Check out these different options on our products page here for more information or give us a call today to discuss further or book in for one of our friendly consultants to visit you.